Former Saturday Night Live cast member Adam Sandler is returning to the show as a host in May, with musical gues Shawn Mendes. The recurring Saturday Night Live guest star came under fire from the president after mocking him on Saturday. Avengers: Endgame star Don Cheadle made a few powerful fashion statements during his most recent SNL appearance. Pete Davidson performed on New Year's Eve and addressed his breakup with Ariana Grande. Pete Davidson sent out a cryptic social media post over the weekend and then deleted his account, leaving fans and loved ones extremely concerned. Game of Thrones fans got to see Khal Drogo once again on last night's new Saturday Night Live. Steve Carell was met by former cast members from The Office, who ask him to come back during the Saturday Night Live monologue. Congressman-elect Dan Crenshaw appeared on SNL to accept an apology for Pete Davidson's controversial joke. Kanye West wore a Donald Trump hat during his performance, which received a negative reaction from the audience. With all things Brett Kavanaugh taking over the news cycle, SNL has a little fun it all. Kenan Thompson Ready for SNL Exit as He Takes on New NBC Sitcom? Kenan Thompson is set to star in the Lorne Michaels-produced Saving Larry for NBC, which has led to speculation that he'll leave SNL. Saturday Night Live has the worst humor in the world, according to Chevy Chase in a new interview. Ryan Gosling, Jessica Chastain, Charles Barkley, Kevin Hart and more messed up lines and goof around during SNL season 43. President Donald Trump and Alec Baldwin exchange bitter words over social media over the actor's dying mediocre career. Donald Trump and Alex Baldwin swap faces in a very realistic Deepfake video that proves how scary this new technology can be. Sam Rockwell unexpectedly let a curse word fly on this weekend's new episode of Saturday Night Live. "Live from New York, it's Saturday Night!" 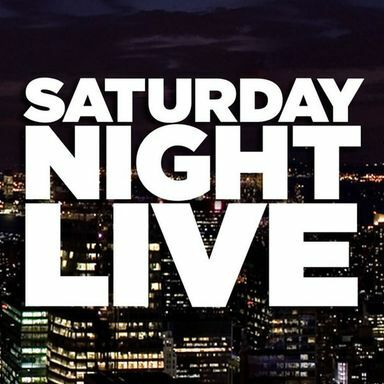 Saturday Night Live is a sketch comedy show that has run since the fall of 1975. Many now-famous actors and actresses such as Dan Aykroyd, John Belushi, Jane Curtin, Chevy Chase, Bill Murray, Gilda Radner, Paul Shaffer, Eddie Murphy, Joe Piscopo, Julia Louis-Dreyfus, Martin Short, Damon Wayans, Joan Cusack, Robert Downey Jr., Dennis Miller, Phil Hartman, Jon Lovitz, Conan O'Brien, Mike Myers, Ben Stiller, David Spade, Chris Farley, Adam Sandler, Chris Rock, Rob Schneider, Norm MacDonald, Molly Shannon, Will Ferrell, and Tina Fey got their start from Saturday Night Live. SNL is still unique amongst other sketch shows because of the fact that it has always been live. Also known as: "NBC's Saturday Night" from October 11, 1975 to July 31, 1976. "Saturday Night" from September 18, 1976 to March 19, 1977. "Saturday Night Live" since March 26, 1977. "Good night and have a pleasant tommorow!"